The recently constituted Department of Political and Peacebuilding Affairs (DPPA), which brings together the former Department of Political Affairs and the Peacebuilding Support Office, is funded primarily through the United Nations Regular Budget. The Department also relies on extra-budgetary resources, which help it respond flexibly and rapidly to increasing demand around the world for its expertise in conflict prevention, mediation and sustaining peace. Today, more than 45 per cent of DPPA’s work is funded through voluntary contributions. DPPA raises voluntary contributions through the Multi-Year Appeal (MYA). The MYA is fully aligned with DPPA’s Strategic Plan for 2016-2019 and its accompanying Theory of Change and Results Framework. 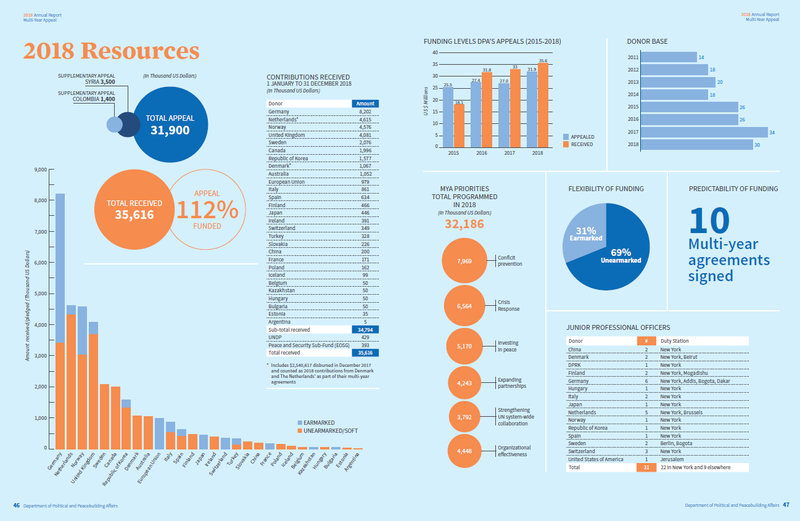 The Department of Political and Peacebuilding Affairs (DPPA) is a main part of the United Nations Secretariat, funded primarily through the world body’s regular budget. But that money does not cover all the work that growing demand for the Department’s expertise and services generates. That means relying on voluntary contributions, mobilized through DPPA’s Multi-Year Appeal (MYA). 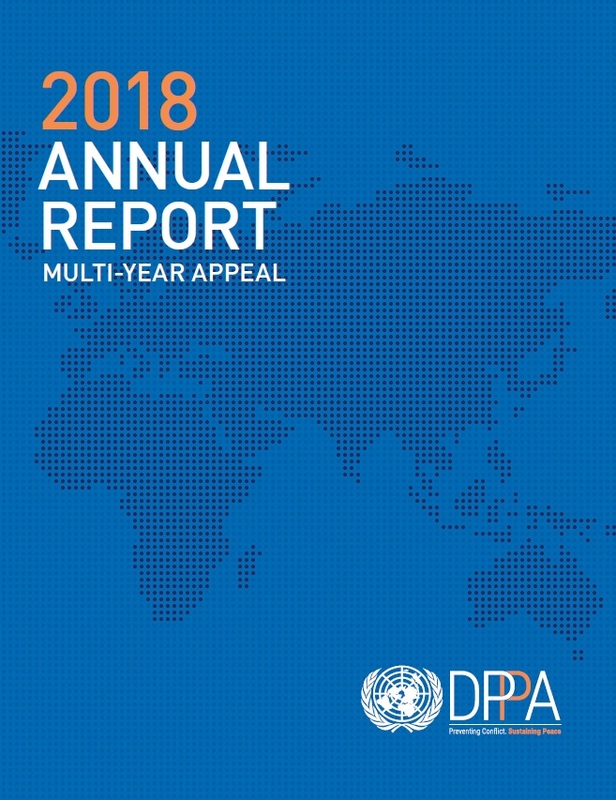 DPPA has just released the latest accounting of the use of such funding, the 2018 Annual Report on the Multi-Year Appeal (MYA), which lists successes for the year but also points to ongoing challenges. The Report contains a wealth of other information on the way DPPA discharges its mandate. Additionally, and to enhance our transparency and accountability, the Report highlights lessons learned and evaluations of our work, as well as key data. The 2019 Update of the MYA reflects on the opportunities created by the reform of the United Nations peace and security pillar and its “whole-of-pillar” approach. The extra-budgetary funding mechanisms of DPPA and the Department of Operations (DPO), as well as the Peacebuilding Fund (PBF), will now co-exist and complement one another, resulting in more synergies in the peace and security work of the Organization, and a more efficient use of resources. The MYA, with its nimbleness, is an ideal funding instrument in a reform context, easily filling critical gaps, or kickstarting activities thanks to its Crisis Response System. When a crisis erupts or violence surges, this flexible funding mechanism allows for timely responses through its Rapid Response Window; and through the deployment - in less than 72 hours - of the Standby Team of Senior Mediation Advisers that support UN Envoys, mediators, Peacekeeping Missions and other partners. The MYA also promotes innovation through the New Ideas Window and helps pilot new approaches in support of the Secretary-General’s key priorities, such as the use of new technologies; youth empowerment; climate security; women, peace and security; among others. 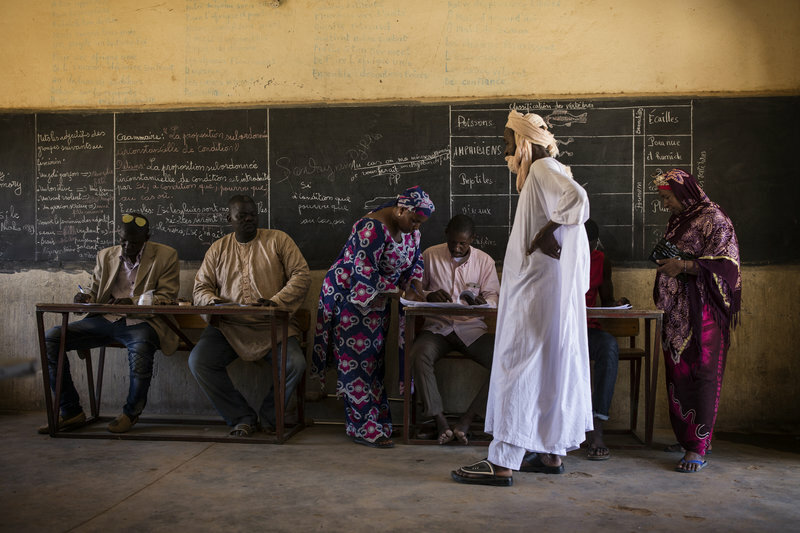 Central to the Secretary-General’s reform is enhanced effectiveness of mandate delivery, improved transparency and strengthened accountability for results. The reform places emphasis on senior management leadership to strengthen the UN’s accountability mechanisms, support results-based management and build a strong culture of self-evaluation. To that end, DPPA is committed to ensure that results-based management and self-evaluations are embedded in our work. The Department undertakes quarterly reviews of project performance and produces Quarterly Progress Updates (Q1, Q2, Q3). During their inception, all extra-budgetary funded projects are required to incorporate risk assessment and mitigation measures. The quarterly reviews provide an opportunity to update risks and monitor progress against results. Additionally, all projects use a gender marker to monitor the level of integration of gender-related activities, assess their contribution to gender equality and women’s empowerment and help increase women’s political participation in peacebuilding processes. Every year in the spring, the Department produces a results-focused Annual Report to ensure accountability and enhance transparency. The Annual Report includes both financial and substantive reporting on the use of voluntary contributions and the main results achieved thanks to the generous support of our partners. For accountability and learning purposes, the Department conducts several evaluative exercises such as After-Action Reviews, Lessons Learned studies and self-evaluations. All evaluations and lessons learned studies are conducted as per the Department’s annual Learning and Evaluation Plan. A summary of the Department’s Lessons Learned Studies and evaluations from 2017-2018 can be found here. Contributions to the MYA are ODA-eligible in recognition of the link between peace and security and development work. 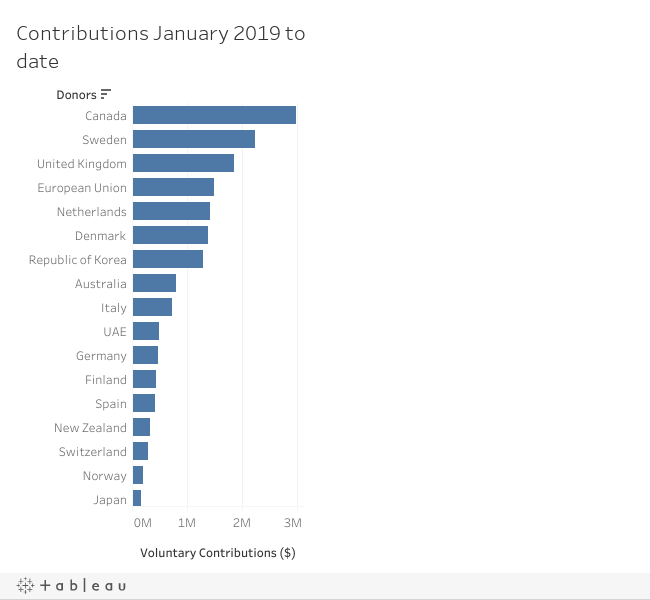 Donors are therefore able to meet their voluntary ODA targets when pledging funds to DPPA and/or when funding Junior Professional Officers (JPOs). The channel code for reporting is 41148 UN DPA Trust Fund in Support of Political Affairs. In addition to providing financial resources, donors can also sponsor Junior Professional Officers (JPOs). The JPO programme is designed to provide young professionals with the opportunity to gain hands-on experience in the United Nations system. For more information on the MYA, please contact Ms. Delphine Bost, Senior Officer for Donor Relations (bostd@un.org), Ms. Nerea Sanchez Mateo, Program Officer for Donor Relations (sanchezmateo@un.org) and Ninamma Rai, Evaluation Officer (ninamma.rai@un.org).